This is the badge of a qualified parachutist. Any who saw action were awarded a badge where the eagle clutching a gilded wreath. 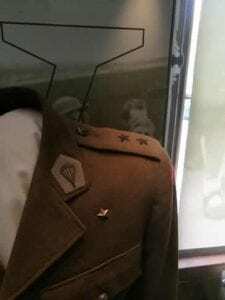 The badge that recruits got on passing the parachute course was also known as "Donkey Ears" in polish. I suppose when you look at the badge you can see why...However it is important to realise that the badge, the "Znak Spadochronowy" was not a sign or emblem of the 1st Independent Polish Parachute Brigade. It was merely a badge to say that training had been completed with the Polish Parachute unit. In other words, even allies (i.e Norwegians, Czechs etc) could obtain the badge. Ballon descent at RAF Ringway? It would appear, according to a 1948 memo that training in 1948 consisted of 2 descents from a ballon at RAF Ringway and 5 descents from an airplane (at RAF Ringway). Some parachutists never actually completed their training (thus no badge) and went straight to Arnheim in gliders (due to a lack of aeroplanes) and in due course landed on enemy soil. General Sosabowski decided that these too should be awarded the combat badges. Some that landed by plane onto enemy soil were also awarded the badge even though they had not parachuted in. 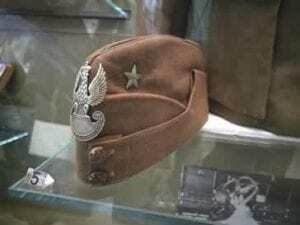 As stated above, the badge of the "swooping eagle" was not a symbol of the 1st Independent Polish Parachute Brigade but rather a symbol that one had passed a parachuting course with the Polish unit. Initially the badge for those that had passed the parachuting course was the same as those that had also undertaken combat parachuting. But later this was to change. 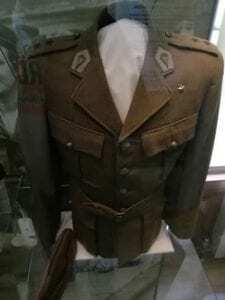 Polish airmen, irrespective of how much combat action they undertook, had the same badge. 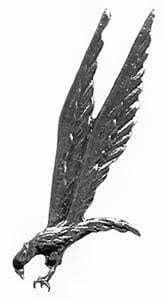 General Sosabowski decided that the swooping eagle badge would be the same, no distinction for those who undertook combat. Parachutists did not get automatic entitlement to keep their badges. If a parachutist was engaged in something dishonourable he could be stripped of his badge by a C-in-C (Commander In Chief). But he could also lose his badge if he failed to make a jump without any provable medical condition. The badge could be earned back if he stayed in good standing with the unit for 6 months from the date of having his badge stripped from him. But this only applied if he had been exemplary and undertaken all jumps (without medical directive to the contrary). If a parachutist had been stripped of a combat badge, this could be earned back straight away if he took part in combat. Initially, the non-ferrous metal alloy badge was silver plated then oxidised and finally coated in lacquer. Those that saw combat wore this badge, but with a gilded wreath that was soldered onto the badge. Then, in a surprise move in 1954, 9 years after WW2, a fresh batch of 2700 badges were cast, slightly bigger than before,§ this time adding a wreath and gilding the wreath. As before, the rear of the badge said "Tobie Ojczyzno" which in English means "For you my country". As before each badge was uniquely numbered. These new badges had something the old badges did not: an identity card, with the name and details of the person entitled to wear the badge. Further, an anchor, being the sign of the Polish underground, was present in the center of the wreath. These new badges were issued to those that had parachuted into Poland. Collar Emblems - were poster grey patches sewn on shirt collars. At the top they were yellow and depicted small parachutes. Grey was traditionally used for infantry and combat parachute parachutists, any service units would use their own colours. Beret - Like the collar emblems these were poster grey. In later years this changed to a darker grey. All the Znak Spadochronowy badges were numbered on the back. Each trainee who attained the badge was handed a badge along with a certificate detailing his name, the badge number and the date attained. 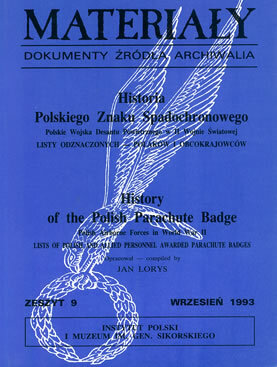 Jan Lorys, a member of the Polish Institute & Sikorski Museum (PISM) collated all this information and published it in a book called "Materialy - Historia Polskiego Znaku Spadochronowego" (A History of The Polish Parachute Badge). Every member who attained the badge is listed here, yes your relative as well! The book is well worth getting although it is out of print and any copy you do locate is likely to cost at least £125 as did my own copy.